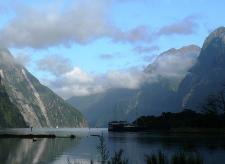 I had completely written off coming down to Milford Sound up until a few days ago. To do a day trip would be very rushed and tiring. Day trips are pretty darn expensive. was pouring down on me? 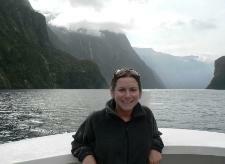 It was decided: I was definitely going to Milford Sound. that I did do an awful lot of looking to the left and to the right while driving. I guess I might have done a lot more than I realized. Probably not the wisest thing – but a solo traveler who is driving by herself really doesn’t have too many other options. it’s not so hard after all to figure out why I was in such amazement. feeling like they found their way into my sheets. would have it, today was a rare day when there was no rain. more of that mystical feeling. For me, 1½ hours on the boat was more than enough. 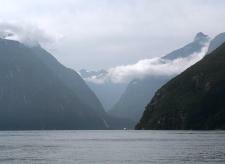 I left Milford Sound feeling really good that I made the trip down. View from the boat jetty. The fog resting in mid-air.